Stressed about tux shopping? Don't be. For most guys, your wedding day is the very first time you'll slip on a tuxedo. So today I'm dishing a few tips to making sure it's the perfect one. All men need to adhere to a few basic tuxedo rules. First, your fingertips should reach the bottom of your jacket when standing. Next, make sure it's not too tight or too lose; remember that a perfect fitting jacket will slightly taper at the waist. Lastly, the sleeves of your shirt should exceed your jacket by no more than one inch. 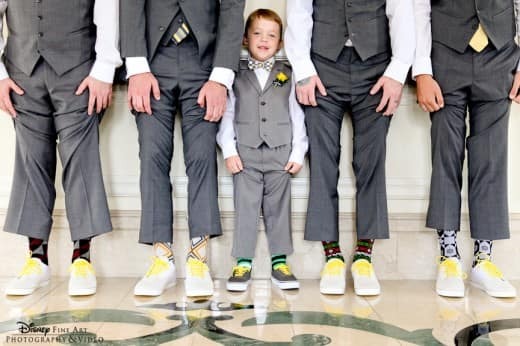 Slender men of a tall or medium height are quite lucky, as most styles of tuxedos will look good on you. For men with a wide face or neck, it is important to not appear as if your tie or bowtie is too tight. To avoid this, stay away from thin ties or wing tip collared shirts. Thinner men should look for jackets with a bit of a shoulder pad to make the body look more muscular. Conversely, shorter and stockier men should avoid shoulder pads at all costs. Stout and muscular men should consider vests rather than cummerbunds to avoid drawing attention to your midsection. Single breasted jackets look best on shorter and slender men, as it helps to give length to your body.